Casino Heroes inks a new deal with British game provider! 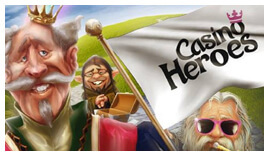 Casino Heroes is a gamified online casino that many British players know. In fact, the company has already been in business for over 5 years, and it needs little introduction to many. Indeed, many British players are happy to call this casino home because this brand keeps innovating. Plus, they’re always looking for new ways to re-defined the status quo. In 2019, the popular casino brand is still committed to entertaining players. And they’re even taking things up to another level by inking a deal with a game provider that is somewhat unknown. But yet looks extremely promising and it goes by the name of Iron Dog Studio! Iron Dog Studio games went live only days ago. And so today, you’ll find many new games on their site! To sum up, Iron Dog Studio is a British brand. In fact, they’re part of the 1X2 NETWORK, and their headquarter is in Hover. Yes, right next to Brighton! Many of their games are available via NYX OGS or Scientific Games platform if you prefer. Currently, Iron Dog Studio has 25 titles under its belt. And their game selection includes table games like roulette, baccarat, and blackjack. They also offer scratch cards and of course slots! In fact, slots games make the biggest part of their portfolio since they have 13 games live and one more in the pipeline. All and all, the studio pride itself in creating games that offer superior gaming experience with new technological advances. So it’s no surprise that a cutting edge casino like Casino Heroes is happy to offer their games. If you’re looking for their games, make sure to do quick research for Blood Queen, Rainbow Wilds, Neon Jungle, or Cherry Blast. These popular titles are already live in the lobby of Casino Heroes. Also, make sure not to miss out The Curious Cabinet! The Curious Cabinet is a horror-themed slot with an excellent max win and it should go live in the coming days!